It’s time for everyone’s favorite game: Photoshopped, or just Florida? 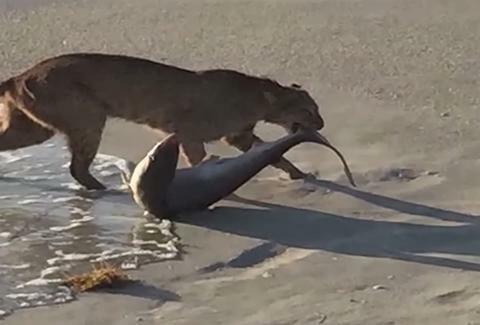 This photo of a bobcat dragging a shark out of the waters of Sebastian Inlet State Park in South Florida is making the round on the Internet, and accordingly, making everyone go nuts. Reported photographer John Baily says he captured the scene right after he saw the cat jump into the water, grab a shark, and start to drag it along the shore. He says the cat then quickly ran off, dropping the 4-foot-long shark on its way, and not allowing him to take any consecutive shots. Talk about a hit-and-run. The photographer promptly sent the photo to WPTV, which of course started a social media frenzy. But wait, don’t cats hate water? Don’t crazy animal battles like this only happen in crazy Australia? The world may never know. In the meantime, WPTV news seems to think the photo is legit.